2.3 kg. , 5.0 lbs. 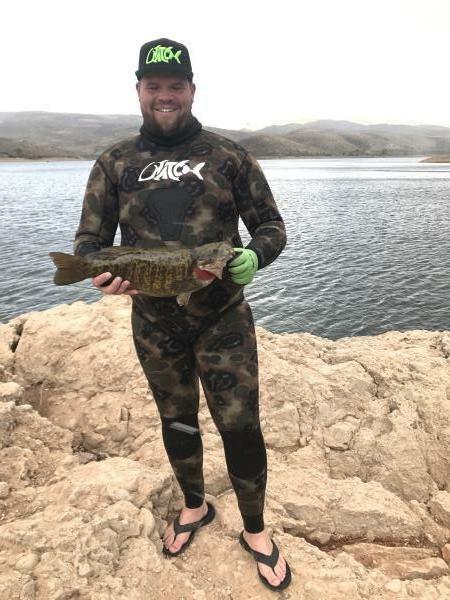 I had seen big small mouth bass up there and wanted to shoot the Utah Sate Record. The day started out by raining and then cleared up so I decided to drive up there and while on the drive up it started to snow. I knew it was gonna be cold which also meant that the bigger fish were going to start to come to the top. I got in the water it was cold for sure. The water was 49 degrees according to my Sunnto D4i. I was swimmming around for about an hour. I made the drop and at about 17 feet I saw him swimming and took the shot. Boom I hit him right in the head. I knew at that second that it was for sure the state record. Which was 4 1/2 pounds. I was so pumped cause there was one local fisherman there and he was almost as excited as I was. I couldn’t be more excited to hold the state record. As I’m driving down to get it recorded, I call my buddy and he says if it’s over 5 pounds it will be he world record. And sure enough it was over 5 pounds. WOW. I immediately called my wife and let her know. I was so excited.